I saw this release on the Tesco mailing list. A luxery box in different versions. Apparently the band was not content enough with the “Return Your Revolt” box. I have got this 7″ size box with a cd on a glass-plate. 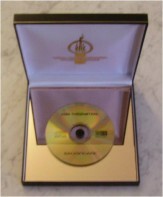 This time the cd is put on a mirror and the box is a very luxery jewlery-like case with a hinge and furnished interior. The box is very expensive (I paid E 45,- for it), especially when you know that besides a booklet there are no extras and even more especially when you notice that inside the booklet a normal release of the same cd is announced on Cold Spring! Nothing I can do about that anymore and I at least got myself one of the 500 beautiful boxes. The music is this time very minimalistic neofolk, with only here and there some orchestrations or a harder tone. The band even made a neofolk version of “Walked In Line”. The songs are alright, but not groundbreaking. I prefer the dark and oppressive sound of the early releases, but I don’t think that there is a chance that the band will return to that. At least there are no lengthy collections of samples on this album, such as on “Return Your Revolt”, so the 72 minute length is completely filled with music. Not bad, but nothing special, besides the expensive package. If you are just in for the music, you might wait for the Cold Spring version. If you can’t wait and/or want to get yourself a Von Thronstahl jewlery box, I got mine from Tesco.